As your outsourced IT vendor we constantly keep your IT systems in mind. Your workstations, servers, and overall network are continuously monitored. A day without reliable IT products and services is costly, we can help reduce or eliminate downtime due to IT infrastructure issues. Our managed service offering allows you to wrangle all your devices, software, cloud services, and even users. With network inventory and mapping, network monitoring and alerting, license management, troubleshooting, reporting, and much more, we provide the tools you need to tackle your IT resources. 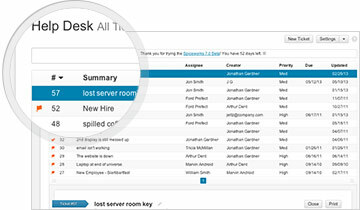 We handle your user requests with help desk software that keeps us in touch and accountable. Our help desk even has a knowledge base for use by your users to speed up resolution of common issues or installation of commonly used software or printer drivers. Inventory all your phones and tablets… in one spot. From iOS to Android to Windows, whether phone or tablet we can enroll your devices and get detailed info like device type, OS, carrier and more – right away! 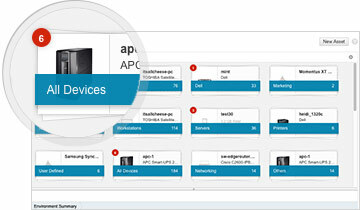 You can even enroll devices using People View or Active Directory to build out your inventory in no time. Monitor your devices, stay in the know. Let’s face it: Users can’t always be… trusted. Track what mobile apps your users are installing to catch any potential issues before they happen. Plus, you can create and customize alerts for jail broken devices, disabled passcodes, out of date OSs and more! Report on anything… and everything. 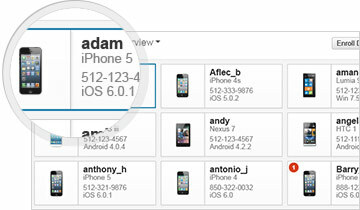 Easily report on any info that is collected about your mobile inventory. Custom reports can be generated in seconds to show the device breakdown, the most installed apps, favored carriers and more! With our Active Directory tools we can check out what devices are assigned to each user, manage checked out equipment, or view all open help tickets. So an employee forgot their Active Directory password… again. Worry not! We can reset it in a snap. 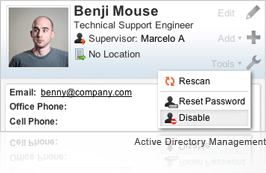 In certain circumstances, such as an employee leaving the company, you can even disable user accounts entirely. Keeping user info up-to-date can be a bit tedious if you aren’t using Active Directory. Good news: Now your employees can take care of it for you! When a user first logs in to the User Portal, they’ll be shown a form to enter all their basic info including name, phone numbers, and job title. They can also upload their own (tasteful) pic and update specific profile data. Out-of-the-box reports can provide all of your users’ general info, their devices, and open tickets. Whether you’re trying to keep track of your company’s hosted email or worried about the cloud services your users are accessing, We can help you track it all. 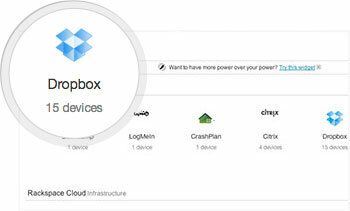 Integration with Dropbox , Rackspace, Office365, Google Apps, and more, let you manage all your services in one spot. And with the cloud service scanner, you can even keep track of the services your users are accessing on their machines (without telling you! ).